Four-page brochure (one sheet of originally brownish, single-weight paper folded in half to make 3¼x6¼"). Published no later than 1938 because the driving directions on the back guide the reader through the Newhall auto tunnel. Further reading: The Walker Family of Placerita Canyon. Admission to park, including Auto Parking, Picnic Table and Stove, Gold-Panning privileges and all other camp recreation, 25 cents per person per day. Children under 14 admitted FREE, when accompanied by parents. Weekly rates: $8, $10, $15 and $20 according to size and location, to accomodate from two to six people. No face towels, bath towels or dish towels furnished. Reservations for Sunday dinners must reach us by preceding Wednesday, accompanied by a deposit of 50 per cent of total. Reservations for other days must reach us four days in advance. Specify meat desired. Choice of Beef, Pork or Lamb. Drive out San Fernando Road through Newhall Tunnel to town of Newhall, about three blocks past the business district of Newhall, just over the bridge, turn right at Auto Club sign marked, "PLACERITA CANYON." Cross railroad track and keep to the right hand road about six miles to camp. Distance from Los Angeles, 35 miles. To a Californian, rings of gold, rosaries of golden nuggets and wedding bells attuned to the tinkling of guitars and pastoral song in amorous strain, are not beyond his conception of life in the early days, for we hear that each Señorita in the Del Valle household beams exultant and proudly in the possession of a circle made from the first gold extracted from the bowels of California's soil in the San Francisco Ranch; other families, the Alvarados, the Lopez and De la Guerras, still retain rings, fistoles, ear-rings and rosaries, relics of the golden days. Francisco Lopez y Arballo, a native of San Gabriel, a descendant of Claudio Lopez, the first Mayor-Domo of San Gabriel Mission, and an uncle of Doña Jacoba Feliz de del Valle [sic], wife of Don Antonio del Valle (our own Senator's grandfather), left his humble domicile in the Rancho Providencia early one morning in the spring of '42, to look after some of his strayed cattle, grazing in the Rancho San Francisco, to hunt the none too elusive grizzly, plentiful in that section, and incidentally, to scan the mountain ridges for mineral strata. He and his mozo had wandered into what is now known as Placeritos Canyon (Canyon of little Placers) about six miles east of Newhall when the siesta hour overtook them. They sat in pleasant converse, under the shade of a gigantic oak, that bathed its life strings in the arroyo that coursed down the canyon, when suddenly his wife's request for "cacomites" (wild onions) came to him, and he started to pick some of these wild native plants. Then, lo, and behold! he noticed yellow particles attached to the roots or bulbs of the "cacomites" and, completely overcome with excitement, began to yell in the most outlandish manner,  "ORO, ORO, MUCHO ORO!" and so boisterously, that his mozo started to run away, thinking his master had gone insane. Presently the mozo returned and together they filled a tobacco pouch with nuggets of gold, taken from the earth with the aid of a pocket knife and a wooden pick. Greatly excited, he started for San Fernando Mission, to make known the news of his discovery. On the following day he left for El Pueblo de Los Angeles to notify the authorities of the discovery of gold. Here, excitement "ran high" and several hundred men started at once for the "placeres," abandoning home and comforts, in pursuit of the "yellow metal." Shortly thereafter, messengers were sent to San Diego and Mexico City, taking the news of the discovery of gold in Alta California. The States of Sonora and Nyarit abounded in expert miners and many gambusinos walked across the trackless desert in search of gold and fortune. It is of record that Don Abel Stearns sent some of this gold to the Philadelphia Mint in March 1843 by Alfred Robinson, and that it was duly received at the Mint on July 8 of the same year. Governor Alvarado took official notice of Lopez' discovery and made public an official "manifesto" in 1842. 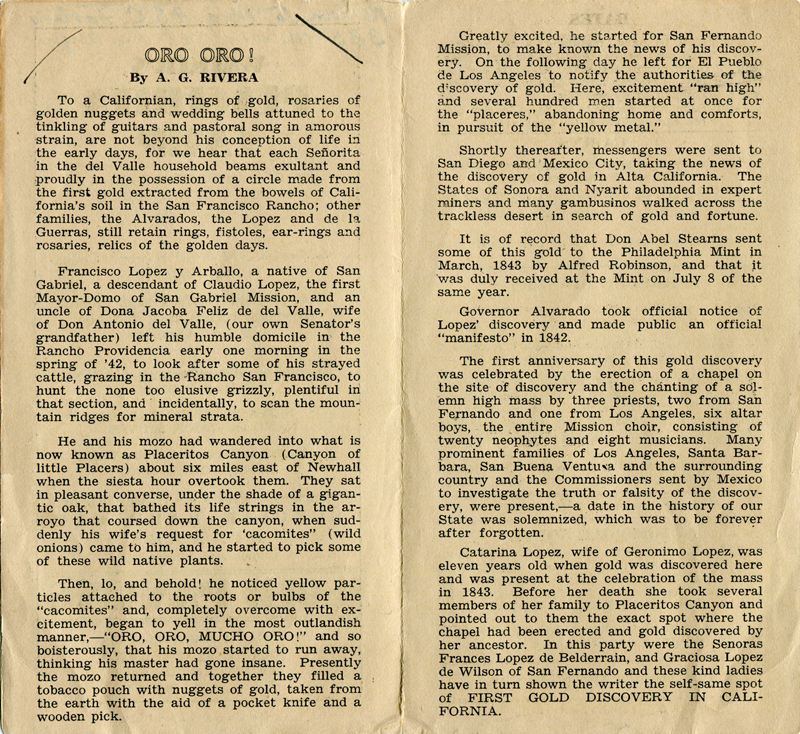 The first anniversary of this gold discovery was celebrated by the erection of a chapel on the site of the discovery and the chanting of a solemn high mass by three priests, two from San Fernando and one from Los Angeles, six altar boys, the entire Mission choir, consisting of twenty neophytes and eight musicians. Many prominent families of Los Angeles, Santa Barbara, San Buena Ventura and the surrounding country and the Commissioners sent by Mexico to investigate the truth or falsity of the discovery, were present,  a date in the history of our State was solemnized, which was to be forever after forgotten. Catarina Lopez, wife of Geronimo Lopez, was eleven years old when gold was discovered here and was present at the celebration of the mass in 1843. Before her death she took several members of her family to Placeritos Canyon and pointed out to them the exact spot where the chapel had been erected and gold discovered by her ancestor. In this party were the Señoras Frances Lopez de Belderrain, and Graciosa Lopez de Wilson of San Fernando and these kind ladies have in turn shown the writer the self-same spot of FIRST GOLD DISCOVERY IN CALIFORNIA. 1. Meaning the downtown Newhall business district. 2. The reference to an "Indian Oil Spring" is peculiar and confusing. There's an oil seep/spring on the Canyon Trail in the Placerita park property, but it appears to be oil bubbling up from the buried casing of an old oil well from 1900. 3. A companion, or lackey.